Is The GENKI Vibration Power Plate Trying To Do Too Much? There are lots of machines that look like the GENKI Vibration Power Plate on the market. That is why many brands aim to diversify their settings and capabilities to bring in more users. There is a lot going on with this model in regard to the exercise option, the accessories, the Bluetooth music connection and the LCD display. The question is, is this all a little too much? The Pros and Cons of this Genki Vibration Power Plate. 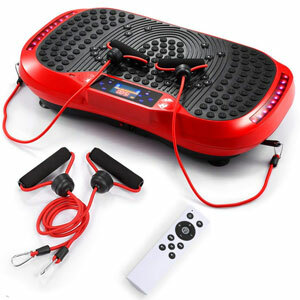 The variety of workout options increases the appeal of this GENKI Vibration Power Plate. For the most part, buyer feedback for this vibration plate is pretty positive. Most are happy enough with the movement and the workout that they get from the machine. There are some that like the option of the lower settings and a gentle movement, such as senior buyers. Then there are those that are happy to push the intensity a little and try new things. are also 8 exercise options for walking, running, yoga and more. This versatility gives this machine a little edge over some of the more basic vibro plates around. There are also some resistance bands in the box. The black ones are a little too tough for some users, but might offer a good challenge as they get more used to the machine and build a little more strength. There is a lot going on with this GENKI 120 Speed Vibration Plate , so it is a shame that it isn’t a little easier to use. The biggest problem with this model seems to be the ease of use. There are some buyers that have had a little trouble figuring out the different settings and quirks. It does help to read the manual carefully before using the power plate because some issues with the set-up and balance. Then there are those that didn’t have too many problems getting started, but find there are too many distracting elements to the design. There are loud beeps when changing settings, which one user couldn’t seem to remove. There are also flashing indicators can can draw users out of their headspace. Furthermore, there have been cases of faulty remote controls, which doesn’t help at all. How does all of this feedback affect the final recommendation on this GENKI Workout Power Plate? There is a definite sense that Genki threw all they could at this machine to appeal to a wider audience. Some aspects of this approach worked out well. There are users that are impressed with the workout options and there is no denying the diversity on offer. Some even claim that this a great value model because of these settings. But, there are too many lights and noises for others. If the company were to streamline the design and focus on the workout, this GENKI vibration plate could become a 5 star option. Find more reviews about the GENKI Vibration Power Plate on Amazon here.